People often stop and give me a funny look when I tell them that I am working on a double major in Art History and Geography. After that look, they invariably ask how these two fields relate to each other. To the surprise of many, they can actually complement each other quite nicely at times. Although, I will admit, when it comes to climate change and art history, the overlap is a little more rare. Which is why I get very excited when I come across papers that combine the two topics. Add a little GIS analysis in there and I am thoroughly hooked. So, what do get when you cross Art History and global climate change? 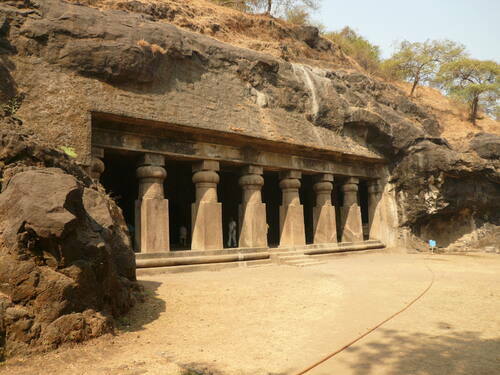 The caves at Elephanta are at risk to sea-level rise. According to a recent paper in Environmental Research Letters, you get numerous cases of art (and cultural) history threatened with drowning by rising sea-levels. Authors Ben Marzeion and Anders Levermann have computed that up to 136 Cultural World Heritage Sites recognized by UNESCO could be at risk to changing sea levels over the next 2000 years (even if the global mean temperature is maintained for the next two millennium, 40 sites are still at risk). They use spatially explicit sea-level rise predictions and high-resolution topography data to figure out which sites, and which percent of global land area, will be affected at different levels of sustained warming. The authors use a time scale of 2000 years for a couple of reasons: they posit that by this time, ocean heat content and glacier ice mass can be considered in equilibrium with global temperatures, and it is still a short enough time-frame to apply to sites of cultural heritage (since many UNESCO world heritage sites are at least that old at present). Rather than estimating time frames for potential impact on the sites, they determine the global mean temperature anomaly which will influence sea-level rise to a degree that it will impact the site anytime within the next 2000 years. The two main contributors to sea-level change over that time scale are thermal expansion of water (>90% of the excess heat generated by enhancement of the greenhouse effect has gone into the oceans) and melting land ice, including the major ice sheets of Greenland and West Antarctica. In their analysis, Marzeion and Levermann use a combination of IPCC model projections and paleoclimate analyses to determine that for every increase in degree K, there will – eventually – be a corresponding increase in global mean sea-level of 2.3m. They do not take into account temporal sea-level variability, such as tides and storm surges. Check out Christopher’s post last week, and think about how changing tides may play into impacting UNESCO world heritage sites. The list of threatened sites includes the Statue of Liberty (scenes from The Day After Tomorrow, like the one to the right, come to mind), the Tower of London, historic parts of Istanbul, and more. I just finished studying the sculptures in the Elephanta Caves, near Mumbai, which is on the list of 40 sites already at risk from sea-level rise.The full list of potentially affected sites, at various global mean temperature anomalies, can be found here (scroll down to the bottom). In my excitement I did a little research, and found out about a couple of contemporary artists who are engaging with sea level change, and climate change on a larger scale. 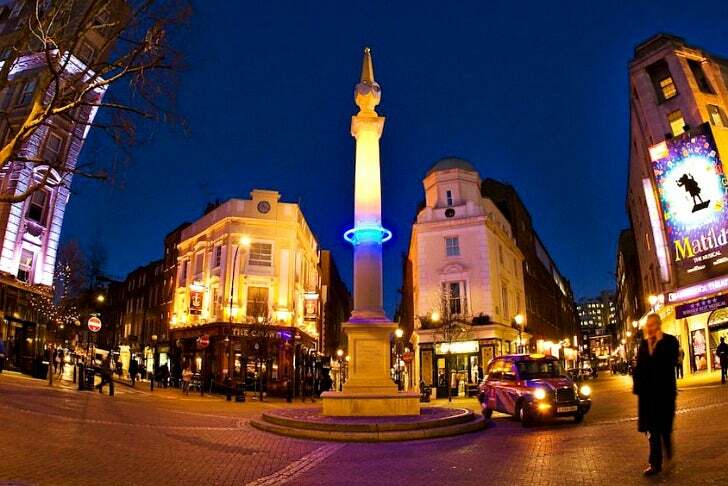 Back in 2012, in his project titled Plunge, Michael Pinksy wrapped strands of blue LED lights around 3 monuments in Central London. The ring of lights marked the projected sea levels 1000 years from now. Similarly, Chris Bodle started his Watermarks project in 2009 in Bristol. For this project, he projects a line, with a measurement, of a future water level on buildings throughout Bristol. He has done some other interesting work on engaging the public in discussions of geography and climate change- I suggest checking him out. And, for a local Vancouver example, in 2012, artists Rhonda Weppler and Trevor Mahovsky painted panchromatic blue stripes from the base of the Cambie Street bridge over False Creek to reflect the estimated sea level rise from loss of one of the major ice sheets (5 metres). They painted lamp posts in nearby Cooper’s Park in the same way. It is also worth spending some time with this blog, by New York-based playwright Chantal Bilodeau, which explores and highlights ways in which artists have engaged with climate change topics. When looking through these links, think about how these pieces function: how do they work visually, and do they promote a deeper understanding of climate systems, or raise awareness about climate topics? This entry was posted in Features by Meghan Beamish. Bookmark the permalink. You can see from the paleological record that we’re in a relatively cool era. Imagine volcanoes that spewed smoke and ash for a million years! I started out in historical archaeology, then prehistoric North America, than African and Human Evolution, and all along with a paleoclimate/historical climate bent. Now I write mainly about climate change and teach mainly about prehistory and archaeology. For a while I was in an anthro department physically adjoining, and sharing colleagues and students with, an art history dept, classics dept, and geography department. So there’s a lot of us who cross these particular trade union boundaries. Well, three of us anyway! And, of course, the Obelisks will be the last to go with sea level rise, being all sticky-uppy-and all. I don’t think your choice in majors is at all odd. I have studied chemistry, sociology, anthropology, ancient history, eastern Mediterranean archaeology, and photography at some depth, but all my degrees are in business-related fields; yet, my main interest these days is climate change and policy. Many sites on Crete will disappear beneath the waves — Kato Zakros on the far eastern end comes to mind. In fact, there are innumerable sites on the Mediterranean coasts.